Big in scope, but not necessarily in a good way. 1248 min. ITC. Director: Charles Crichton. Cast: Martin Landau, Barbara Bain, Christopher Lee, Leo McKern, Ian McShane, Peter Bowles (II), Roy Dotrice. Space: 1999 was big, no question. At around $300,000 per episode, the show was, in 1975, the most expensive in television history, and it had broadcast commitments from more than 100 countries. After the Big Three television networks passed, the show wound up in syndication (as Star Trek: The Next Generation would thirteen years later), where it floundered through forty-eight episodes over two seasons and whimpered off of TV screens. Worse, what turned out to be pretty close to the end of the line for co-creator Gerry Anderson (save for a handful of shows that amounted to one-season wonders) also spelled the end of his marriage to co-creator Sylvia Anderson. So yeah, Space: 1999 was big in scope, but not necessarily in a good way. The show is best remembered for two reasons: the post-Mission: Impossible pairing of Martin Landau and Barbara Bain, and the splashy, feature-quality special effects crafted under the supervision of Brian Johnson, a British special effects whiz who had worked on 2001: A Space Odyssey and later collected Oscars for Alien and Star Wars: The Empire Strikes Back. With regular directors including Charles Crichton (A Fish Called Wanda), Ray Austin (The Avengers, The Return of the Man from U.N.C.L.E. ), and David Tomblin (The Prisoner), spectacle largely trumped story, but you can't have everything. Space: 1999 tells the story of Moonbase Alpha, a research colony that—on my twenty-fifth birthday (September 13, 1999)—suffers a gigantic explosion of unwisely buried nuclear waste and spins off into the outer reaches of space. Moonbase Alpha's complement of 311 includes Commander John Koenig (Landau), chief medical officer Dr. Helena Russell (Bain), science officer Professor Victor Bergman (Barry Morse of The Fugitive), chief pilot Captain Alan Carter (Nick Tate), and data analyst Sandra Benes (Zienia Merton), among others. With each new world the crew encounters, the potential for colonization is always at the forefront, but the explorers must also remain on guard against hostile alien lifeforms. What distinguishes Space: 1999's brand of weekly sci-fi is a tendency to the metaphysical. Though approached in a corny style reminsicent of Star Trek's largely maligned third season, such stories give an interesting window on post-hippie philosophizing circa the mid-seventies. Sylvia Anderson claims the star duo was inordinately difficult, and off-screen turmoil obviously affected the final product. Bain often seems curiously anesthetized, and Morse was—for whatever reason—killed off between the first and second seasons. The show's design, though impressive for its time, hasn't aged well, particularly in its proliferation of beige. Still, the show won a loyal (if humbly sized) fanbase, retains a certain kitschy appeal, and features Christopher Lee, Peter Cushing, Joan Collins, Ian McShane, Leo McKern, Peter Bowles, Roy Dotrice, Brian Blessed, and Catherine Schell in first-season guest appearances. 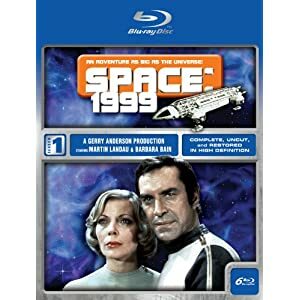 Space 1999: The Complete First Season makes its Blu-ray debut in a feature-packed seven-disc set made up of five Blu-ray discs presenting the twenty-four episodes of Season One, and two DVDs of bonus features. With "restored" transfers derived from the original 35mm elements, the image quality is outstanding, distinguished by deep blacks, impressive detail and true color (though the original color scheme tends to be dishwater dull). I can't imagine this series ever looking better: in particular, the pre-CGI filmed special effects sequences look terrific. Audio options likewise maximize the original elements: purists can go straight to the Dolby Digital mono tracks, and A&E also provides DTS 5.1 mixes that add a bit of oomph to the aural experience with wraparound sound effects in the space action sequences. A&E simply isn't kidding around when it comes to the bonus features here: they're fairly exhaustive, although there's little participation from the on-screen players (Landau and Bain don't participate). The set includes Image Galleries (HD) for all twenty-four episodes, and Music Only Tracks (in Dolby) for all episodes except "Breakaway" and "Dragon's Domain." Also found on the BDs are Restored, Textless Titles and commentary by Gerry Anderson on "Breakaway" and "Dragon's Domain." The two DVDs come crammed with more extras (some presented in anamorphic widescreen, which is always nice). Best of set is "These Episodes" (1:35:18, SD), a collection of episode-specific retrospectives for the best of Season One; constructed of clips and interviews with producer/co-creator Gerry Anderson, executive story editor/scriptwriter Christopher Renhold, scriptwriter/script editor Johnny Byrne, Zienia Merton, and supervising editor David Lane, "These Episodes" will be the extra fans will most appreciate. "Memories of Space" (7:16, SD) takes a more general approach with the same participants giving an overview of the series' creation and their experiences producing Season One. The "Sylvia Anderson Interview" (16:13, SD) is the set's juiciest extra, with the series' co-creator dishing with ruthless honesty about the series' troubled production and the difficulty of working with Landau and Bain (she also discusses UFO, The Protectors, and other Anderson productions). Also on hand: "Textless Generic Titles" (1:44, SD); "Concept and Creation" (12:38, SD), with more about the series' genesis; the self-explanatory featurette "Special Effects and Design" (16:52, SD); "reconstructed" 1975 television documentary "Clapper Board" (38:59, SD), which looks at the history of Supermarionation, with rare footage from the sets; "'Guardian of Piri' Remembered" (1:36, SD) an interview clip of guest star Catherine Schell; "Barry Gray's Original Theme Demo" (1:23, SD); "Alternate Opening and Closing Titles" (2:58, SD), "Landau and Bain US Premier Intro and Outro" (1:54, SD); "SFX Plates and Deleted SFX Scenes With Music Track" (11:41, SD); trailers for the compilation telefilms "Alien Attack" (3:36) and "Journey through the Black Sun" (1:53); and "Ad Bumpers" (:38, SD). I'm sure fans will agree that this is the best way to collect Space 1999, a big leap up in quality from DVD transfers that were knocked for their shoddiness. With enough bonus features for a month of Sundays, the series has at last come home in style. All site content © 2000-2019 Peter Canavese. Page generated at 04/25/2019 03:06:39PM.